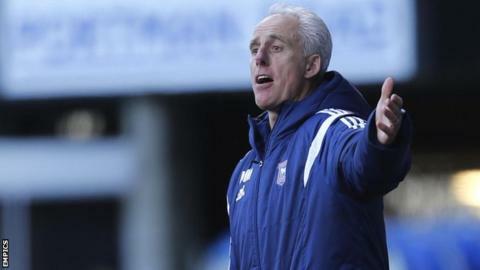 Ipswich manager Mick McCarthy expects Blackburn to be dangerous opponents on Saturday as his side look to secure a Championship play-off place. A draw at Ewood Park will be enough for Town to finish inside the top six. Blackburn are ninth and have nothing to play for, and McCarthy thinks Rovers will be relaxed and eager to impress. "They want to send their fans home happy and they're not going to lay down and die for us," the former Sunderland and Wolves boss told BBC Radio Suffolk. "If you aim for a point, you might not get anything. If you aim for all three, you might get a point." McCarthy continued: "We have to assume [play-off rivals] Derby, Brentford and Wolves are all going to get three points - but they'll be looking at us and thinking we'll get something at Blackburn. That's the way you always feel in that position - you always feel more positive about the opposition. "So I do think we'll need to get something out of the game, and we saw Nottingham Forest last week using all the dark arts of the game to slow things down when it was 1-1. "I don't blame them. They wanted a point. They tried their socks off to get a result and I don't doubt Blackburn will be the same. "I wouldn't want to be on my home patch with the opposition fans singing 'we are going up' and I'm sure [Blackburn manager] Gary Bowyer will be the same." With Daryl Murphy having last Saturday become the first Ipswich player in 52 years to score 25 goals in a season, and Blackburn's forward pairing of Rudy Gestede and Jordan Rhodes netting 41 goals between them this term, goals appear guaranteed at Ewood Park. "People will assume so, which means it'll inevitably be a 0-0 draw, and I'll take that now," added McCarthy.